Very lightweight, semi-rigid, poly mesh slip on with a stay open top. Measures 2 3/4" x 6". Size of the cap allows for more growth. Comes in bundles of 100. Designed for one application prior to photo-degradation. Open the top with your fingers, squeeze the seams and slip over the leader leaving room for bud growth. Hold securely in place with 1 staple parallel to the stem at the bottom of the cap on both sides of the terminal leader (not through the stem). When you squeeze both seams together, the top opens up and will stay open when stapled. If the top doesn't open you are squeezing and stapling the wrong way. Designed to install and walk away and Breathe Easy. No moisture retention or build-up, removing the threat of mold and mildew. Guaranteed drainage and positive air flow. Less heat build-up within the cap. Positive ventilation results in less flapping and less "wind catcher" damage. Terminal leader is sheltered from desiccation. 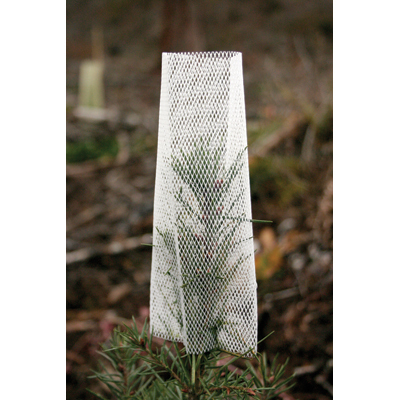 The tight mesh configuration provides a micro-climate shade factor that shows better vigor and bud development. Can be applied in any weather condition, on the assembly line at sorting, or in the field after planting. If you are currently including bud caps in your deer & elk browse protection program and haven't seen the Breathe Easy cap, please let us send you some a sample. We think we've come up with an economical and effective device with initial installation and performance reports being very positive. Call Toll-Free 1 (877) 736-5995 or email Brad at bradm@pacforestsupply.com.